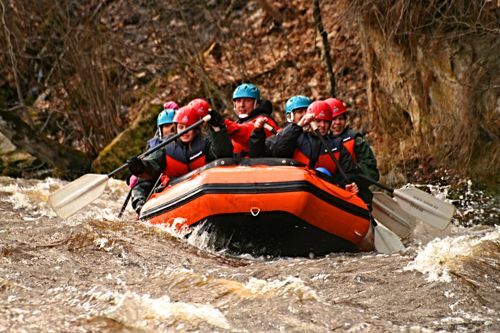 Events held at Raudsilla Entertainment Complex often include bogshoeing tours, rafting/canoeing, adventure park activities and peaceful nature tours. Thanks to these natural phenomenon hiking at Raudsilla is especially memorable. These activities are exciting and full of adventure where participants have to overcome numerous obstacles and challenges. Can you imagine falling into a 70 metre deep valley? With experienced guides and safety harnesses it looks more dangerous than it actually is! In addition to extreme obstacles participants learn many useful tips about how to survive with the bare minimum. These tours are perfect after a seminar/conference or just as one party of an exciting day at Raudsilla. The untouched nature at our complex provides the perfect location for a teambuilding event away from the city. Marshes near Raudsilla are beautiful and untouched. Bogshoeing is an activity anyone who is able to walk can undertake. Our guides will teach you the best way to utilize you bog shoes. Canoeing on Valgejõgi offers satisfaction with your own achievement- I was able to do it. Because at first it seems like a challenge to stay afloat in a flimsy canoe. Our guides will give participants a few pointers after which everyone starts feeling at home in the canoe. The nature at Raudsilla is very protean. On a relatively small area most of Estonia’s precious biomes are represented. Nature Bingo is a hike where everyone has to pay close attention to their surroundings. To add a competitive aspect- participants are divided into teams and scored on their observational skills and knowledge about Estonian wildlife. An exciting and relatively wet competition between rafts on Valgejõgi. Is there something else you wish to do at Raudsilla? Don’t hesitate to ask and we will design a tour just for you! Spirited location and kind staff! There is no doubt that everyone liked the location. It was unique and unforgettable. Big-big thanks! It was a wonderful day full of sun.